An amazing, free, current, searchable, compilation of hundreds Windows commands with explanations, syntax, and examples of their use. And, it’s free ! The function request is not supported. This is a result of a March 13th update. The previous error message was shorter, but an Apr 17 update elaborated the error message to read as above. The link explains how to resolve using group policy but the simple fix, as of May 8th, is to apply the KM4103725 monthly rollup update. This will require a reboot on most servers, but should resolve the problem once complete. It seems Windows 10 Update fails sometimes, especially with the Fall Creators Update. It continuously wants to install, you approve, it runs, and fails, often with error code 0xc1900208. However, I also recently read about an issue with attached USB drives oddly causing the update to fail. Recently, on a PC on which I tried all of the aforementioned options, and had no attached USB devices, I discovered a DVD in the drive. Once ejected the update installed without a problem. This strikes me as very bizarre, but perhaps the update searches other available drives for some reason. Therefore; I recommend if having issues with Windows updates, try disconnecting any USB devices such as external drives, thumb drives, phones which may be charging, and possibly even USB printers, and don’t forget to check the DVD tray, just in case. Have you ever opened an Adobe document and been surprised to see hieroglyphic-like, unrecognizable, characters? Having seen this a few times and having found dozens of solutions on the internet, some of which seem rather complex, I did a little tinkering. It seems the common denominator is one simple change; allowing “document fonts”. I confess I have not run across this with Adobe Acrobat Reader, but if Adobe Standard or Pro, there will be an Adobe “Printer”. To resolve the problem………. Windows 7/8: Open Control Panel and then Devices and Printers Right click on the Adobe “printer” and choose Printer properties. This requires a restart to take effect. On several systems over the past year I have seen the C:\Windows\Temp folder filling up with large .cab files generated by the system, on a semi-regular bases. This continues until there is no available drive space and the system becomes unusable. The short term solution is to just delete all of the files but the problem returns after weeks or months, depending on the initial free drive space. It seems this is caused by a large log file within the C:\Windows\Logs\CBS folder. To resolve I created a folder C:\Windows\Logs\CBS_Archive and moved all CbsPersist_file_number.log files, older than 10 days, to the archive folder. This seems to have resolved the issue. I was asked to look into a beeping in a server room which no one could find. It was understandably difficult as there were three server racks with modems, routers, switches, servers, PCs, UPSs, CCTV, and audio equipment. To add to that they were single beeps, quite wide spread apart, and within a noisy, concrete room. I determine after a little while they were single beeps and exactly 15 minutes apart. Typically first suspicions are the UPS units, but 15 minutes is not typical of APC UPS devices. To make a long story short, it turns out in a far corner where 2 fiber internet connections entered there were small UPSs units supplied by the service provider. One of the UPS units showed a failed battery. Being behind the open steel door, no one had seen the light. This seems like a trivial post and an obvious solution but I am posting as there are many forums on the Internet with people not being able to locate a device creating a beep every 15 minutes. This is common with FIOS, Verizon, and Bell equipment. One story goes as far as to explain a fellow turning everything off in the server room, one device at a time, every 15 minutes, till everything was shut down and unplugged, but could still hear the beeps. For simplicity there are many reasons you may want a single URL or FQDN to access a resource internal or external to your corporate domain. 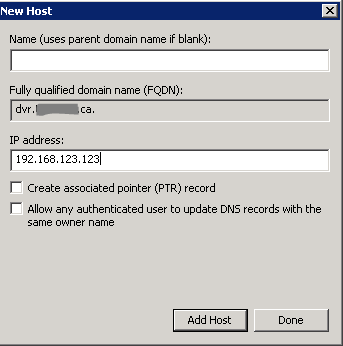 If the internal and external domain names are the same it can sometimes cause DNS issues resolving the public domain name from the corporate network. I am often asked about this in reference to web sites; “why is our website accessible from anywhere but our buisiness network””?” For example you want to access www.net-works.ca from a network that uses the internal domain net-works.local. The internal DNS server manages DNS for net-works so it doesn’t pass on the request to the forwarder, but it also doesn’t have a DNS record for the www Host. The simple solution is to create an internal zone for the host name you are trying to access. SBS 2008/2011 did this automatically for “remote” so that the same URL could be used internally and externally. This technique can be used for access ing websites, dvr systems, or anything you like that uses a FQDN. 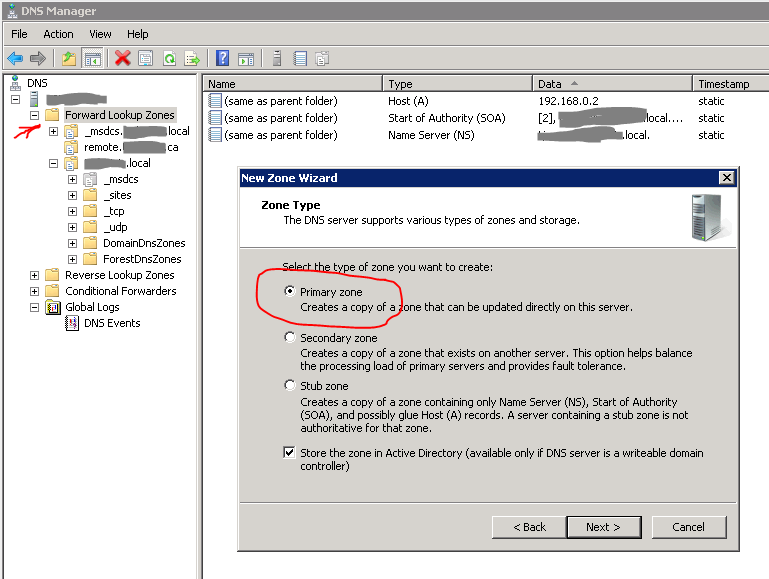 To do so open the DNS management console, expand the folders under your server name, right click on the “Forward Lookup Zones folder, and select New Zone. A wizard starts, click next and you can select the zone type. Accept the defaults, Primary Zone and next. 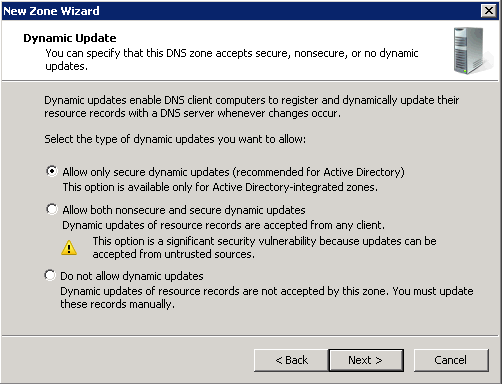 Select “To all DNS servers running on domain controllers in this domain”. In this case I am going to set up a universal URL for access to a DVR system, so I will enter dvr.net-works.ca This could be www, remote, or what ever meets your needs. Keep in mind for external access you must set up the DVR, or matching, Host record with whichever service manages DNS for your public domain. Again accept defaults, and click next, and finish. Now right click on the new zone folder and choose “New Host (A or AAAA)” record. Finally, again accept defaults except insert the IP address. In this case it is an internal IP. There should be no need for a PTR record creation. It seems Server Essentials and possibly others will often show in the daily report a DFSR Event ID: 2147485861 error. There is also a corresponding Warning Event logged in the DFS Replication log (sub-folder of Applications and Services Logs) of the event viewer with Source DFSR and Event ID 2013, followed by an Event ID 2212. This is most often caused by a dirty shutdown. Then in the error message within the report locate the command as highlighted in the image above, but cut and past it from your server report as it will have the correct volume GUID. Make sure it is all one line. You may want to use Notepad to reassemble if broken in the report. You need to use an elevated command prompt to run this. If you run the command with the wrong GUID it will display; “No Instance(s) Available”. This should resolve the problem, but it may return at some point in the future. The Windows Server 2012 Essentials Build document (wiki article) suggests to prevent this in the future, after running the command successfully, change the aforementioned registry key from 1 to 0. Doing so enables DFS Replication automatic recovery. Recently after installing a new Linksys (Cisco) EA6300 router we received a “502 – Bad Gateway” error message when trying to access the web management page. Installation of the router and configuring went as expected, and internet access by client machines was fine, but after completion and reboot the Bad Gateway message appeared when trying to log back into the router. This seems to be a common issue with numerous models not just the EA6300, but also the EA6500, EA4500, EA2700, E4200, E1200, and more. There are numerous posts about this issue on many blogs and message boards, all of which suggest starting to resolve by pressing the reset button. If you have a detailed configuration with custom IP configurations, port forwards, DDNS and more, that would be quite a nuisance and time consuming. We discovered simply disconnecting the WAN / Internet connection to the router and refreshing the web management page allowed access and log in. Once logged on the WAN connection could be reconnected. Logging out and back in reproduced the problem. The solution was to gain access as described and then using the built-in utility update the router’s firmware. Once updated there were no further problems. There are numerous 3rd party applications that require .NET 3.5 and/or .NET 2.0 such as QuickBooks, Profile, and more. Normally you simply go to: Control Panel, Programs and Features, Turn Windows Features On and Off, select .NET Framework 3.5 (includes .NET 2.0 and 3.0) and install. However with Windows 10 it will want to “Download files from Windows Update” and then fail, primarily when joined to a domain that has WSUS (Windows Server Update Services) enabled, resulting in an Error code: 0x800F081F. If you are using an ISO file you can mount it so that it can be accessed using a drive letter within Windows 8/10 by highlighting the ISO file and choose manage then mount, from the menu bar in Windows Explorer. 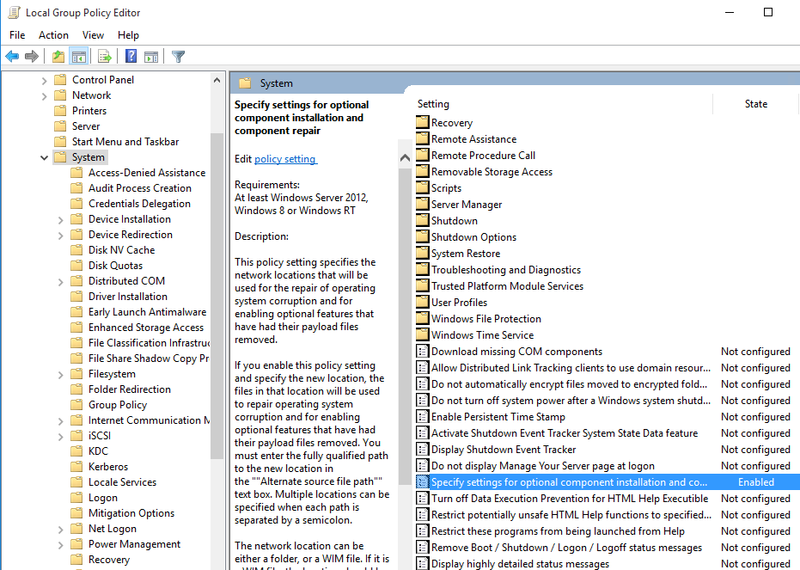 Edit local group policy to look for your ISO when Microsoft Update cannot be accessed. Open group Policy by entering gpedit.msc in the search box or from an elevated command line. In the right hand window, scroll down past the folders and locate the specific policy: “Specify settings for optional component installation and component repair”. 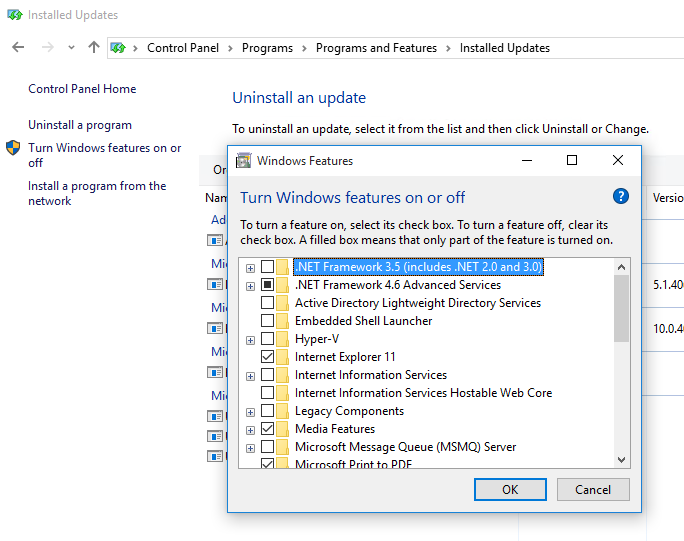 Note: there is an option in the policy to “contact Windows Update directly” but this did not work for me or others. Now you can return to: Control Panel, Programs and Features, Turn Windows Features On and Off, select “.NET Framework 3.5 (includes .NET 2.0 and 3.0)” and install. It should locate the files and install without a problem. I recommend a reboot after doing so. Update: I am not sure when the change took place, but at least on Server 2016 and newer, during the install with “add roles and features” you will be prompted to point to the location of the files. No need to edit local group policy.